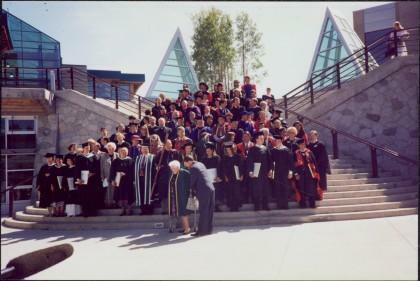 Photograph depicts large group posed on ceremonial steps in Agora courtyard at the University of Northern British Columbia in Prince George, B.C. Most individuals in group wear regalia. Bridget Moran appears to be standing in center of second row, hand raised to her face. Item is part of the Bridget Moran fonds. See also items 2008.3.3.1.5, 2008.3.3.3.14, 2008.3.3.3.15, 2008.3.3.3.38, and 2008.3.3.3.39 for images featuring similar content.